Nicole Roberts, a New York based laptop bag designer with an artistic bent, says she learned a lot working for big textile companies and built on that knowledge during a two-year stretch she spent in Thailand. The Thai adventure was indirectly what launched her into the laptop bag business. The night before she left for the Orient, Roberts bought a new laptop computer, looked around for a suitable bag, and couldn't find one that combined form and function to her satisfaction - so decided to make her own. As Nicole puts it, "One thing led to another, and NokHoo laptop bags were born," adding that she's traveled extensively with the bags, and they've stood up well through much wear-and-tear. "NokHoo" is the somewhat onomatopoeic Thai word for owl; because owls are both handsome and wise, Nicole thought it seemed like the perfect name for her new line of "Pretty Smart" laptop bags. 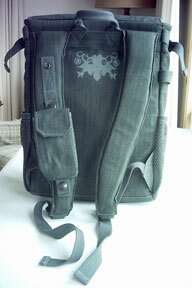 NokHoo's Raining Paradise laptop bag. NokHoo backpacks combine imaginative practicality and utility with attractive, somewhat exotic looks, first rate materials, and fine workmanship. 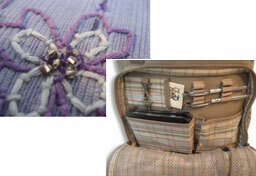 They come closer to being objets d'art - or at least fine examples of handcraft - than any laptop luggage I can think of. Roberts currently makes four different NokHoo backpack models: a "Raining Paradise" model in periwinkle, the Etruscan Red "DeLoverly" with bird and butterfly-themed hand embroidery and beading, the "Toasted Sesame" colored "Sirrush" with its dragon motifs, and the "Icarus" model in gunmetal grey. Broadly speaking, the first two will likely appeal more to female users, while the earth-toned Sirrush and Icarus have more masculine themes. I chose an Icarus for our test unit. Functionally, all models are identical. Considering how commodious it is internally, the NokHoo backpack is surprisingly compact in external dimensions, measuring 11" x 16" x 8" and weighing in at three pounds when empty. Even small-framed individuals should find it comfortably manageable, but it can still hold a lot of stuff. Features-wise, starting at the outside, the NokHoo's adjustable shoulder straps are padded with what feels like half-inch closed-cell foam sheathed in the rugged fabric that is used for the case's outer skin. An interesting wrinkle is a snap-on, Velcro-closure pouch of just the right size to hold an iPod or iPhone, which can be positioned either low or high on the left-hand strap's outer face. There is no belly-band, but the case is small and well balanced enough that you probably won't miss it, even on longer treks. There is also a convenient handle-loop at the top for carrying the pack briefcase-style on shorter hauls or when just shifting it around. Both sides of the NokHoo case have a net pocket of about half the case's height with elasticized closures - useful for carrying water bottles and other incidentals to which quick access is handy. The NokHoo backpack's front face features a fold-over flap decorated with each model's thematic motif in combined silkscreen, embroidery, and beadwork, with a smaller silkscreen design on the front of a small, Velcro-closure pocket on the lower right corner that is accessible without opening the main flap. 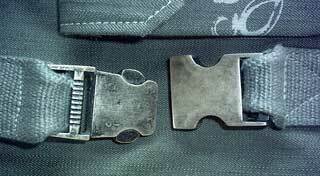 That main flap secures with a robust metal quick-release buckle whose substantial looks and pleasantly smooth, positive action says quality hardware. Releasing the buckle's clasp and folding back the flap reveals a three-quarter depth zipper-closure compartment large enough to hold peripherals and other bits, such as optical discs, mice, modestly-sized books, or even an iPad (but watch out for that metal key fob). There are also two pen/pencil sleeves on the left, opposite the little outer pocket. I also found it could accommodate several portable laptop stand or lapdesk products, such as the Targus X-Stand, and I was even just able to get it zipped closed with a Lapworks Futura folding lapdesk inside. Inside the front face of this compartment is a full width net pocket with a vertical zipper closure that will be especially useful for storing cables neatly (or that iPad more securely). Opposite the main case body's front face are two open shallow pockets, a handy metal quick release key fob, and four more pen/pencil/stylus loops - these ones elasticized. Immediately behind this outer compartment is an inner, nearly full-depth zipper-closure pocket for slimmer items. 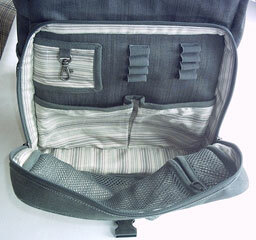 Inside the backpack's main body are two full-dimension compartments. The rearmost one is the designated computer compartment, generously padded on all sides with approximately 3/16" closed-cell foam and with a Velcro-closure retainer strap. It's large enough to accommodate any Apple notebook up to 15" display size, and I found my old 14" Pismo PowerBook fit neatly, with lots of room to spare for the extra width of a widescreen 15" MacBook Pro or PowerBook G4. The other (frontmost) compartment is plenty big enough to accommodate a second laptop, as you can see from this photo, with both the Pismo and a 12" iBook comfortably accommodated, and there's certainly enough room in there for an iPad (or two or three with suitable padding!). The front compartment can also hold bigger stuff, including larger laptop stands, file folders, magazines, books, or what-have-you. 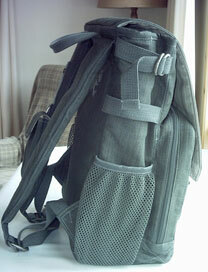 It also has a zipper-closure full-depth pocket on its front wall. The entire NokHoo interior is lined with a soft-texture cotton fabric in various patterns, depending upon the model chosen. 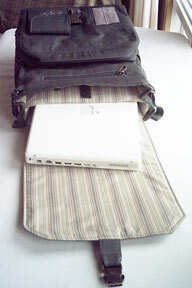 There are also internal water-resistant membrane linings to protect your laptop and your back. You can't top the look and feel of natural fabric, and the entire NokHoo case is 100% cotton material. The instructions specify hand-washing with cold water and mild detergent, bleach, then hanging to dry. When reviewing a product, one feels obliged to find something to criticize, but I had a lot of trouble coming up anything to criticize about the NokHoo backpack. I suppose one might observe that they're so strikingly attractive that they are more obviously computer cases than would be evident with more ordinary-looking backpacks, so the risk of attracting unwanted attention from thieves may be greater, and the $150 price tag is on the steep end of the spectrum for laptop cases, but that's the downside of extraordinary good looks, high-quality fabrics and hardware, and hand craftsmanship - none of which come cheaply. Other than those caveats, it's pretty difficult to see where you could go wrong. The NokHoo's design, appearance, functional practicality, and quality are all superb. A solid four star rating and a big thumbs-up - with a smile. Currently NokHoo makes backpack cases exclusively, but Roberts plans to expand form factor options in the future. NokHoo bags are priced at $150 and guaranteed to be free from manufacturing defects for life. If your NokHoo bag has a problem due to materials or workmanship, the company will replace or repair it ASAP (of course, not to include typical wear and tear or bag abuse). Also, if it turns out not to be what you were hoping for, your bag can be returned for any reason within 30 days of purchase. Buyers from the US, Canada, Europe, Australia, and Thailand can order directly from the NokHoo website. If you're buying from other locations, contact NokHoo for shipping costs. All payments are in US currency; the buyer pays customs and taxes. 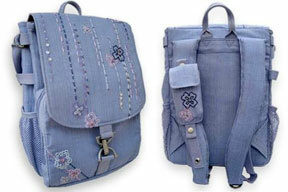 Currently there are four different NokHoo backpack models. Left to right: NokHoo's Sirrush, DeLoverly, and Icarus bags. Inspired by the paintings of Gustav Klimt, Raining Paradise is sure to turn heads. Vertical lines of hand embroidery and beading on a rich textured surface give this bag a look that is absolutely unique. 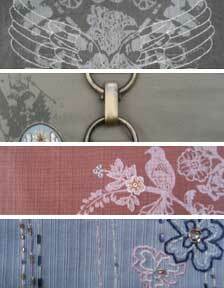 When birds and butterflies mingle with hand embroidery and beading, the result is DeLoverly. Elegant details, unique textured fabric and smart design make this bag both feminine and practical. Legend has it the Babylonians were protected by a dragon they called Sirrush. If the Babylonians could name this bag, we're pretty sure Sirrush would be it. Practical styling and durable fabric protect you and your laptop from harm, while cool layered artwork makes you a legend in your own time. In Greek mythology, Icarus flew on brilliantly crafted wings made of feathers and wax. NokHoo's Icarus shares that spirit of creativity and craftsmanship-comfortable fit and useful details combine with print and metallic embroidery to create a heavenly bag (just don't get too close to the sun). Textured heavyweight cotton exterior with contrast print inside. 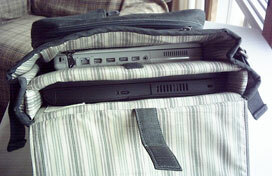 Padding throughout bag saves your laptop and your back. Interior padding is water and shock resistant. Main section has separate laptop pocket and secret zip pouch. 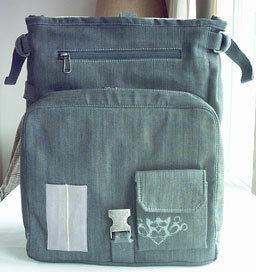 Zippered front section provides multiple pockets made for CDs, business cards and gadgets. Detachable phone pocket on strap. Elastic side pockets for easy access.